When we see a horse 🐴, we recognize it automatically and we can talk about it by using the word horse. It seems effortless how the brain and the language can refer to something in the real world. In the case of language, this is known as referentiality, while in the case of the brain, it's called intentionality. What do these two words even mean? When we talk about referentiality, we mean that a word, such as toy has a meaning that it refers to. This can be a token or a type. A type means an abstract category of toy which includes all kinds of toys, where as a token is a toy in the real world. To illustrate this, we can look at the following picture. While a language can refer to something in the real world, the brain doesn't fall too far behind. Intentionality is often understood as the capacity of the brain to refer outside of itself. And we get a nice illustration out of this one too. Does the brain refer outside of itself? 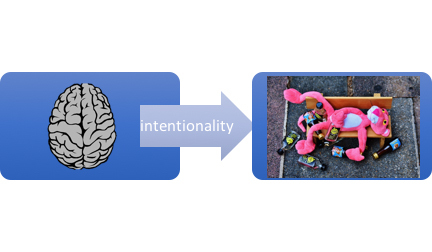 My take on the notion of intentionality is that the brain cannot refer directly to anything outside of itself. We know that our perception (like vision) is an illusion created by the brain. We never perceive the world around us directly, but processed by the brain. 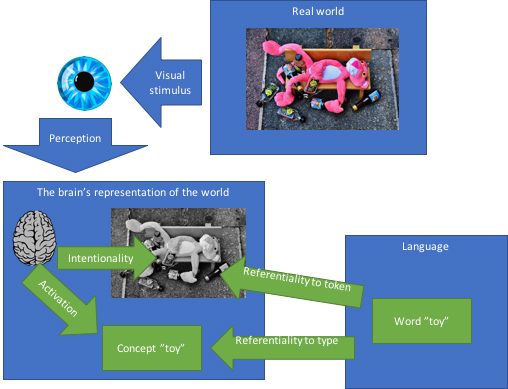 Again, in order to understand what a toy is, we need to have a mental representation for it, or a concept, if you may. 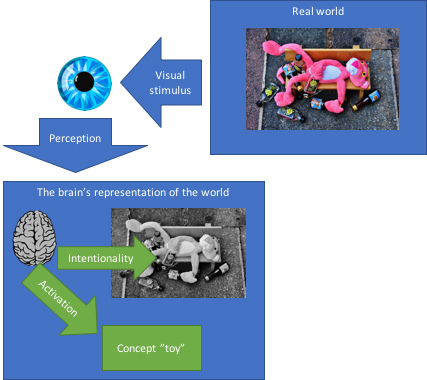 So we receive a visual stimulus, then the brain creates an illusion of our surroundings to the conscious mind and after that the brain can use intentionality to refer to the toy inside of the illusion it has created. So, in other words, the brain can only refer to what is inside of itself, and to us, it seems that it refers directly to the real world, because the illusion is so accurate. That's why the brain can equally well refer to a hallucination and a real thing, because from its point of view, there's no difference. The following image might help you understand what I am after. Now that we have a decent understanding of intentionality, we can put the referentiality in the same picture. 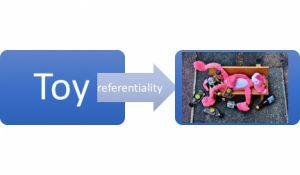 As I stated before, the referentiality can refer to both types and tokens, but never directly to the real world. The reference has to be done through the brain. Previous Post: How does the 3D vision work? Next Post: Are there any good gay themed movies?